Many tools exist to assist in assessment of decision-making capacity. The following are commonly used, reliable, and feasible to perform in an office setting: Aid to Capacity Evaluation (ACE), Hopkins Competency Assessment Tool (HCAT), and Understanding Treatment Disclosure (UTD)1. 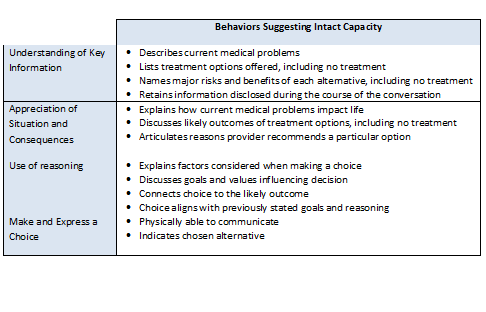 Apply the four key abilities required for decision-making capacity to the patient interview and determine whether an elderly adult has capacity to make a given medical decision. Decision-making capacity involves several cognitive domains: memory, executive function, reasoning and language. While normal aging leads to changes in some of these domains, advancing age alone does not lead to impaired decision-making abilities in the cognitively healthy. Many neurodegenerative disorders, however, cause progressive cognitive deficits in the domains needed to make medical decisions and impair medical decision-making capacity over time. Additionally, age-associated sensory impairments may complicate the ability to engage in decision-making, and geriatric syndromes like depression and delirium affect attention, memory and executive function, causing transient impairment. Describe the differences between decision-making capacity and competency. Name the four abilities an individual must demonstrate to have decision-making capacity. Describe observable patient behaviors that demonstrate these abilities. Identify available tools to facilitate capacity assessment. 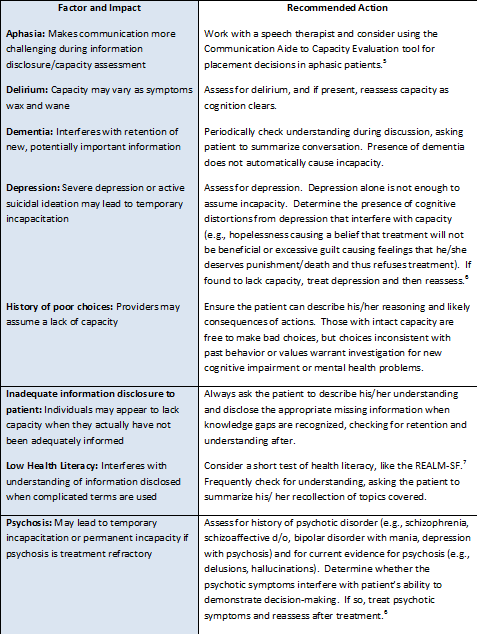 Evaluate a patient for factors that may confound capacity assessment. 1. Sessums LL, Zembrzuska H, Jackson JL. Does this patient have medical decision-making capacity? Journal of the American Medical Association 2011; 306(4): 420-427. 2. 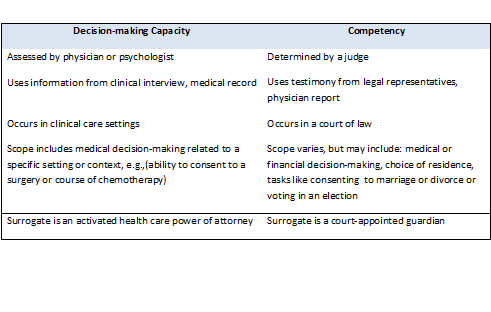 Etchells E, Sharpe G, Elliot C, Singer PA. Bioethics for clinicians: Capacity. Canadian Medical Association Journal 1996; 155 (6): 657-661. 3. Appelbaum PS, Grisso T. Assessing patients’ capacities to consent to treatment. New England Journal of Medicine 1988 Dec 22; 319(25): 1635-1638. 4. Tunzi M. Can the patient decide? Evaluating patient capacity in practice. American Family Physician 2001; 64: 299-306. 5. Carling-Rowland, Alexandra. (2012). Communication aid to capacity evaluation (CACE). Available at: http://www.aphasia.ca/home-page/health-care-professionals/resources-and-tools/cace/ Accessed 5/11/2016. 6. Okai D, Owen G, McGuire H, Singh S, Churchill R, Hotopf M. Mental capacity in psychiatric patients: systematic review. British Journal of Psychiatry 2007; 191: 291-297. 7. Arozullah AM, Yarnold PR, Bennett CL, Soltysik RC, Wolf MS, Ferreira RM, Lee SD, Costello C, Shakir A, Denwood C, Bryant FB, Davis T. Development and Validation of a Short-Form, Rapid Estimate of Adult Literacy in Medicine. Medical Care 2007; 45: 1026-1033.